When I was in my twenties, I went with my friend to donate blood. I am B-positive and 12 percent of the people living in South Africa share the same blood group. Unfortunately, due to my weight and blood pressure I could not become a blood donor. So, I decided to become a bone marrow donor instead. There is a 1:100 000 chance of being a match to someone so the odds are really very small. And given my rare blood group, I am sure the odds are against me. But, they are not! The day before we left for overseas I received a call from the South African Bone Marrow Registry to tell me I had been identified as a possible match for someone. That day was really very emotional for me, as this is a call you wait for, but never really expect. Two weeks later I was contacted again to start the procedure of further testing. I had to go for 6 vials of blood to be drawn. This to me was extremely traumatic as the Sister at the Pathologists did not listen when I told her to use a baby needle to get my blood. Instead she insisted on jabbing me over and over again with a large needle, causing pain and stress where she did not have to. Not only did she make the visit a bad one, she has caused the vein to ‘harden’. This is a normal side affect of a blood draw, but it is so uncomfortable, and has left my arm feeling tight, which worsens when I train at gym. I could take asprin for it, but I am not one to take medication when it is not necessary. And the feeling should resolve within 3 weeks. The first time I had the blood draw done, I was offered tea and biscuits by the nurse on duty. This time, I was sent on my way, without even a sip of water. With such low blood pressure, and the stress of the jabbing, I decided to make my own biscuits. 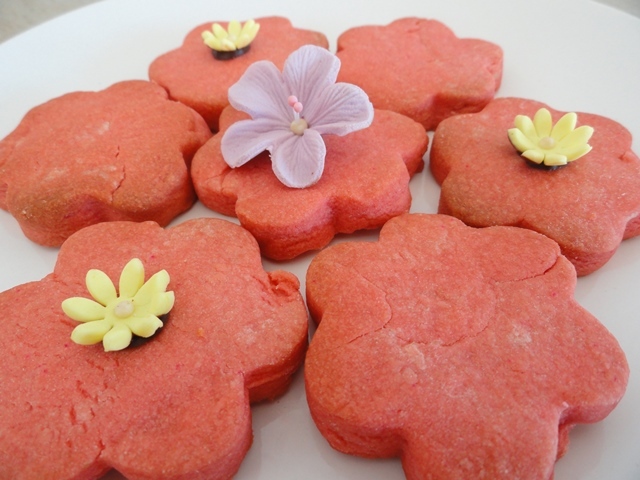 And because this is all in aid of blood cancer, and this is cancer awareness month, I made these rose pink biscuits. Specifically, today is National Bandanna Day in South Africa. This day is created in awareness of the need for bone marrow donors by The Sunflower Fund. If you are in the UK and interested in finding out more about bone marrow donation, please take a look here. Sadly, I heard last week that I am not a 100% match and so the process for me ends here. Such a brave story Tandy! I have had a very similar unpleasant experience with blood draws. Rose cookies sound lovely. I wonder how these nurses can get it so wrong! Very adorable cookies and I like rose water in sweets. Such an honorable thing you are doing to be on the list but sorry for all the pain it brought on. Ohmygawsh! The nerve of them not to give you even water! But I bet everyone giving blood would rather have had some of these cookies! Good for you being a bone marrow donor Tandy! I can’t give blood either as right now with treatments I’m giving, I have to get blood work done every few days. Bleh. 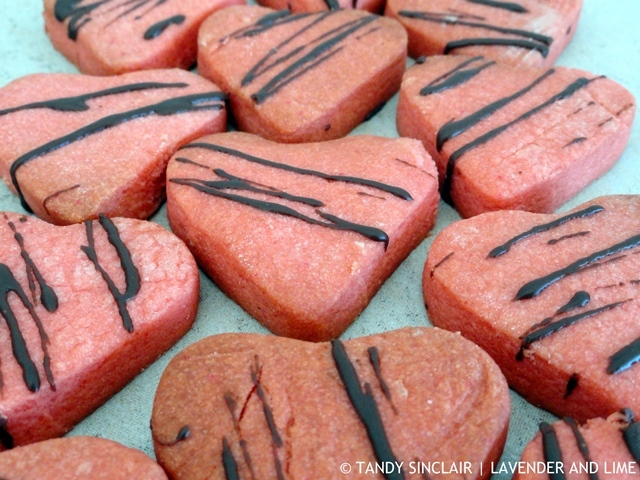 Anyhow, this rose biscuits are beautifully adorable and I want to make for Valentines Day to make my family happy. I’ve been looking for an excuse to buy rose water for a while now and think I finally found my excuse!!! These biscuits are very pretty too, hope they made you feel a little better after that traumatic experience. Oh, such pretty biscuits – Tandy – I do hate having to have blood taken, but how great that with you rare blood group you have chosen to be a bone marrow donor. Your biscuits are such a lovely color Tandy. Donating bone marrow is such a honorable thing to do, good for you. Ouch! Lovely biscuit recipe, though. Just the fact that you donated is huge Tandy. It’s unfortunate you weren’t a match but you at least tried. This was such a beautiful story and I absolutely love this pink biscuits. Great new site as well. They look so cuuute!! Perfect for kids party! Good for you for trying to be a donor! What a selfless and courageous decision. It’s too bad you had such an awful experience with that nurse. The biscuits look terrific. these look very pretty indeed tandy. isn’t it awful when people don’t listen? i had a nurse jabbing me over and over one time to get blood. she finally gave up and told me to come back again to the clinic. i was not happy; when i told the young man who did take my blood, he rolled his eyes when i told him who she was. clearly she was well known as being lousy at it. but these biscuits would make up for it. How awful for you, and how inconvenient that you had to go back! Wow that is a terrible experience Tandy! I’m so sorry to hear that, especially as you are only trying to do a good thing! Oh! These rose pink biscuits look so gorgeous and delicious, Tandy. And addition of rose water sounds super intriguing. Can’t wait to try these! So much trauma and then to be told you are not a match. Pretty biscuits.